Photograph of a ceiling in the Arhai-din-ka-Jhonpra Mosque at Ajmer in Rajasthan, taken by Lala Deen Dayal in the 1880s from the Curzon Collection: 'Views of places proposed to be visited by Their Excellencies Lord & Lady Curzon during Autumn Tour 1902' . Lord Curzon served as Viceroy of India between 1899 and 1905. The Arhai-din-ka-Jhonpra Mosque (or Hut of Two and a Half Days) lies just outside the Dargah of Khwaja Muin-ud-Din Chishti in south-west Ajmer. This early example of Indo-Islamic architecture was begun in c.1200 by Qutb-ud-Din Aybak (r.1206-1210), Sultan of Delhi, and completed by his successor, Shams-ud-Din Iltutmish (r.1211-1236). The mosque was built in yellow sandstone and reused masonry taken from local Hindu and Jain temples. 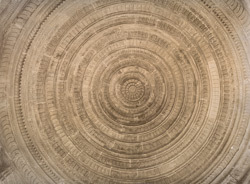 This is a view of the interior of one of the domes, carved with concentric patterned friezes with a lotus flower in the centre.